Poondu Kuzhambu- Kuzhambu is one of the best dish from Southern India. This has a very tangy taste with garlicky flavour. 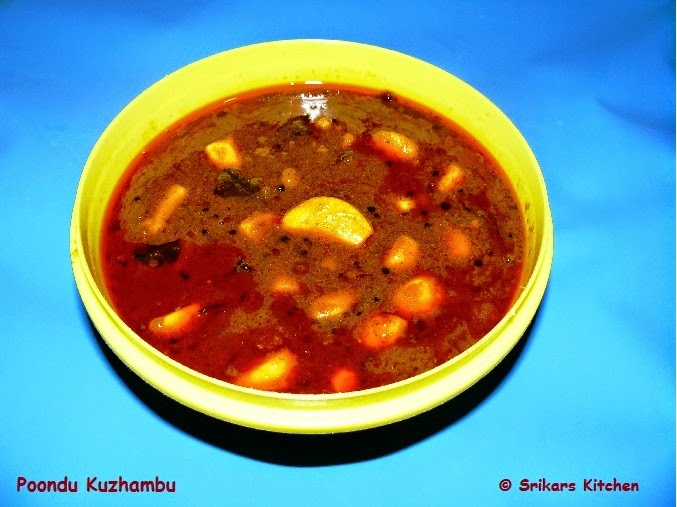 Sambar or kuzhambu are one of the main dish in everyday palate. The difference between the sambar and Kuzhambu is adding cooked dal in sambar, whereas in Kuzhambu we don't add any cooked dal. We can keep it in fridge for a week.Normally i am make this kuzhambu once or twice in a month. My hubby is great fan of Kuzhambu like Vathal Kuzhambu. Kara Kuzhambu, Peanut Kuzhambu & Ennai kathirikkai Kuzhambu. Soak the tamarind in warm water & squeeze the juice from it around 3-4 cups. Chop the tomatoes & grind to a paste. Heat sesame oil in a pan, add mustard seed, fenugreek seed,channa dal. red chillies & allow to temper. Add peeled garlic & allow to sauté up to 2-3 mins. Meanwhile add sambar powder,ground tomatoes ,salt in squeezed tamarind water. Once the garlic is sautéed & tamarind mixed water . Allow to boil. Allow to cook until oil floats out. Serve with plain rice , papad & ghee. Love anything with garlic.. delicious and flavorful kuzhambu. My mouth is watering here, wat a fingerlicking kuzhambu..